I owe some thanks to a goldfinch for saving me some work the other day. I was taking a brief rest in the garden, planning to return to my weeding in a few moments. But then this natty little fellow came hopping along and caused me to change my plan. I love having these colourful little birds around for the summer – and clearly they need to eat – so how could I possibly continue with my project? I left the forget-me-nots in place that day, despite my chronic desire for tidiness. And since then, each time I’ve gone into the garden I’ve been careful to pull out only the very worst of the straggly stems, leaving most of the seedy buffet in place. I guess this means we’ll have a whole lot of forget-me-nots in our future…but hopefully, we’ll also have a lot of returning goldfinches. A reminder if you’re on Gabriola Island this summer: about a dozen of my marine-focused prints are on display at Gabriola’s popular dockside eatery, Silva Bay Restaurant & Pub. I hope you’ll stop by for a meal and have a look. 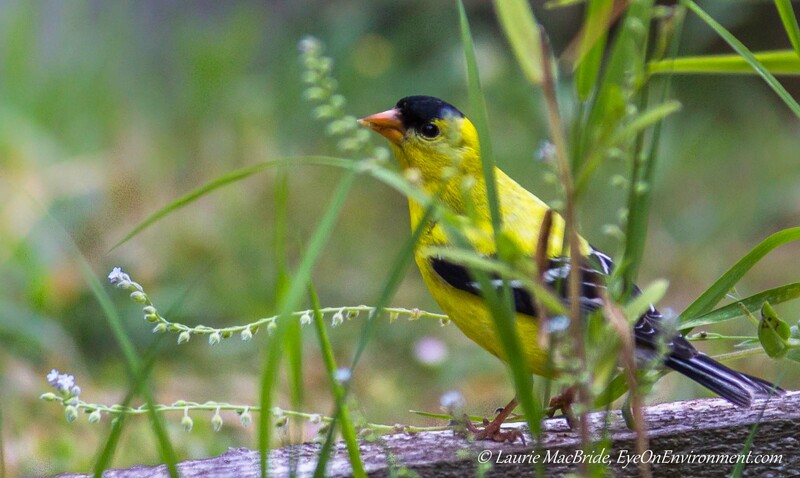 Posted by Laurie MacBride, Eye on Environment on June 25, 2015 in Birds and tagged animal behavior, feeding, flowers, Gabriola, gardening, nature, photos, plants, summer. Some of our best moments in life are when we change plans like that…Love the images you shared. 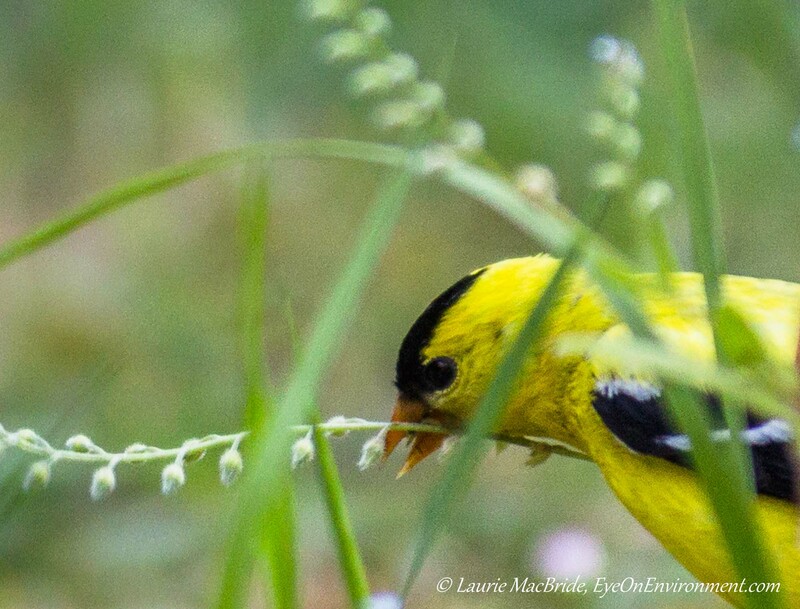 The goldfinches are beautiful and totally worth putting up with some scraggle! Thanks, Sherry! They are pretty little birds – even the less colourful females are lovely, I find. Beautiful birdie–and forget me nots are beautiful too.